Thank you to all those who purchased a remembrance poppy from the school office. The organisers of the ‘Poppy Appeal’ have written to the school to thank us for raising £51.57. A massive well done to the boys football team who beat Beaumont 6-0 in a league match. Awesome score, you are all superstars! Thank you to their coaches and to Ms Smith. We are looking forward to seeing lots of you at the Christmas Fair tomorrow (Saturday). We are open from 11:30 for ice skating (this needs to be booked in advance) and then the main fair opens at 12:00 and closes at 3:00. Thank you to those of you who have offered your help and support for this event. The fair will be opened with our amazing Infant and Junior Choir singing some festive songs. We are sure it will be a great day for all of the family! In addition, each year we host a Breakfast with Santa where the children can join us in the school hall before school to have some fun, eat a healthy breakfast and get to meet Santa himself! This Year the event will take place on Monday 10th December at 8:00. 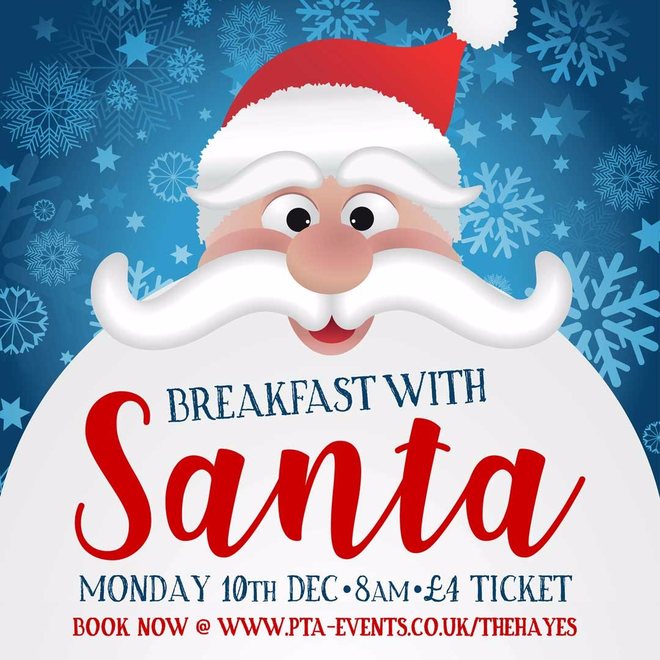 Tickets for this event sell out quickly and will be going on sale on Monday 26th of November via the PTA events page: https://www.pta-events.co.uk/thehayes Please note, children who usually attend breakfast club are welcome to come to this event but will need to purchase a ticket via the above link. Please see below for a letter from the PTA. On Wednesday this week Class 10 are leading our assembly and parents and carers of children in this class are invited to join us in the school hall for a 9:10 start. Also on Wednesday we wish our football team good luck in their match against Gresham. The Science Dome will be arriving in school on Thursday for our children in Year 4. We are sure they will be wowed by this exciting experience! Another football match takes place on Thursday against Atwood this time. Good luck to the team! The immunisation team will be in school on Friday administering the Nasal Flu Vaccination to all children in Years R through to 5 whose parents have given consent for this to happen. It is also our Open Afternoon from 2:15 on Friday 30th November. If you are free to come in we welcome you to visit your child’s class room and view their learning. They have much to show you that they are very proud of. Doors open at 8am, please bring your child/children to the main school entrance to be signed in. At the end of the breakfast the children will be escorted back to their classrooms to carry on with their normal school day. If your child/children have any special food requirements please indicate where specified on the booking form. - If your child/children attend breakfast club and would like to attend breakfast with Santa, a ticket will need to be purchased as it is a PTA run event and separate to the Breakfast club. - Santa will not be visiting children in Breakfast club. He will remain in the school hall. - When booking your child/children a ticket, please make sure you tick that they attend breakfast club so we can create a separate register for Breakfast Club children. - Your child/children will be collected from breakfast club at 8am and brought to the school hall to join everyone else. Finally like with all our events we can never have too many volunteers! If you are able to help at the breakfast please volunteer by ticking the volunteer box on the booking form.